This picture is very similar to one I posted a few years ago, and while I guess you could say this is a remixed version of the original I don’t know which one I prefer. I kind of like them both :) There’s something cool about a length of thick twine tied to a post that makes for an interesting photograph, especially when you can get close. Maybe it’s because it creates a sense of nostalgia or conjures up thoughts of simpler times, or possibly it could be that pictures like this invite the viewer to create a larger story in their own minds. Whatever it is, I like photos such as this and fortunately they’re not too difficult to find either. This was taken (where else?) right near Theta Pond on campus and even though it’s similar to its 2016 counterpart I like how this one offers more context, more life, and more of a story to tell. I had my Fuji X100F with me, partly because I really like shooting with it and partly because it’s so much smaller than a DSLR that I end up carrying it more places, and even though it’s not designed to take close-up shots it does offer some degree of macro capability such that I can often get decent results without using my 50mm lens and a close-up filter. It’s not the same as a true macro lens but the X100F does have a close focusing range of about 5 inches which is enough for what you might call macro-lite photos. I think what attracted me to this particular scene was how the rope and post were somewhat hidden amidst the leaves of a gingko tree. It created a bit of a sense of mystery, even though the actual scene in real life wasn’t all that noteworthy. I shot this at f/4 partly to get a slightly wider depth of field but also because the X100F does get a little soft when using wider apertures to focus at close distances. I also shot this in JPEG using Classic Chrome and I don’t think I did much in post other than possibly add a bit of vignette. I really like the JPEG files straight out of the X100F and sometimes I think it’s fun to deliberately try to get things right in camera and not postprocess at all (or just a tiny little bit). This is a classic case of me forcing myself not to over-think things and just go with the results I get. Agree whole heatedly about getting satisfactory photographs SOOC and not to bother w/ RAW files and post processing I am also a user of Fuji XT20 and JPEG and have been very pleased w/ the results w/ minor editing in Google Photos. I noticed your choice of Classic Chrome film simulation. What are your preferred choices and why? This posted image will look great w/ Fuji Acros simulation. I like the photo, simple as it is. 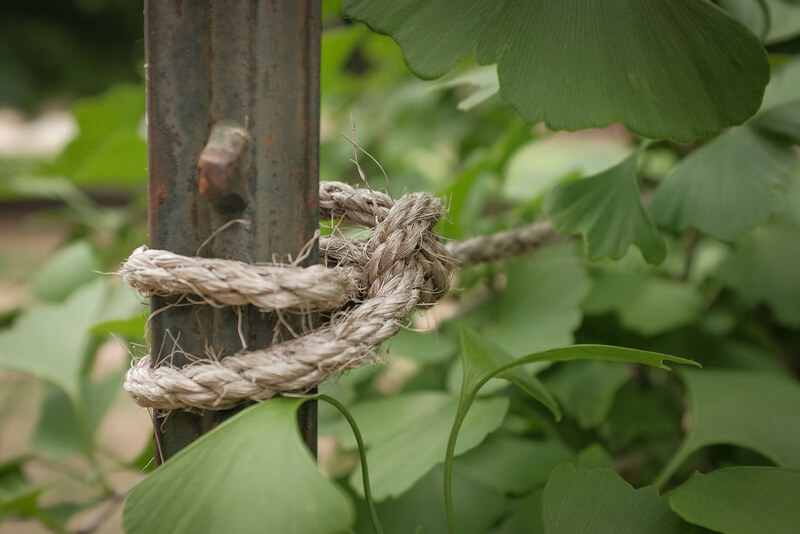 The knot is framed by the Ginko leaves and the fence post so your eye goes directly there before wandering around the scene. Once again you illustrate the fact that we can find photo opportunities in very ordinary and familiar locations.